Gargamel\’s has casted an evil fog spell to capture all the Smurfs. The whole village is gone and you\’re the only Smurf left! Run away from the fog, stroll across a vivid world, collect iconic Smurf items and save all your fellow villagers to become the true hero of the day! 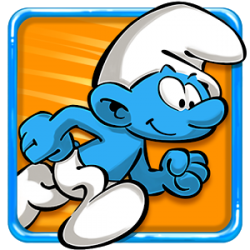 * RUN, jump, glide, stomp, dash… your way through more than 100 levels to free all the captive Smurfs. * DISCOVER a vivid and lively world directly inspired from the original Smurf comic-books. * PARKOUR different locations of the Smurfs world including the village, the forest, the mine and Gargarmel\’s Castle! * PLAY with your favorite Smurfs including Smurfette, Papa Smurf, Handy Smurf, Grouchy Smurf and more than a dozen other iconic characters! * COMPETE against the world and your friends in the Weekly Tournament. Who will run the longest from the evil fog? * COLLECT dozens of items from the Smurf universe to complete sets and get awesome rewards. * EARN great prizes everyday by collecting Golden Keys, completing Daily Missions or asking the Farmer Smurf for his Good Deals.